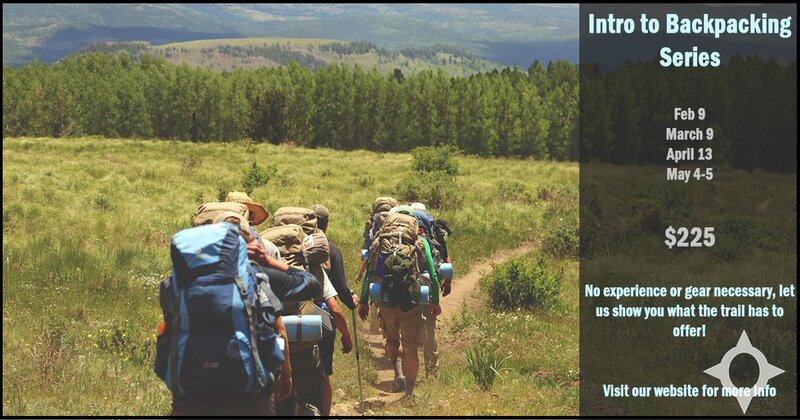 Join us in this four part Intro to Backpacking Series Course to learn all the basics of backpacking! Learn about all the gear and clothing you need while trying out items in our rental inventory. Once you have all the gear, backpacking can be an extremely cheap adventure. However, the process of finding the right gear that works for you, can become pretty costly. In this class, we will go over all different types of backpacks, sleeping bags, sleeping pads, and tents to try and figure out what works for you while learning about material, repair options, the importance of weight, and more! Learn all about Leave No Trace Center for Outdoor Ethics and why it is so important to practice while backpacking. We will also discuss how to plan your trip properly and safely. Practice hiking on strenuous terrain with a full pack. In this class, we will also practice map and compass skills to make sure that you can rely on yourself (and not just phones and gps devices) to navigate. Meet at Creekside Meadows Picnic Area at 1 p.m. Bring your packed backpack, rain gear, water, and a snack. Utilize all the things you learned in the classroom with an actual backpacking trip! We will hike 4 - 6 miles each day with full packs and stay in a backcountry campsite in beautiful Shawnee. During this trip, we will workshop hanging a bear bag, filtering water, cooking and cleaning in the backcountry, navigation, and more! *These classes all build upon the other. *These courses are taught by our Outdoor Adventure Coordinator, Erin, who is a Leave No Trace Trainer, certified as a Wilderness First Responder, and has been teaching and leading backpacking trips for over three years.